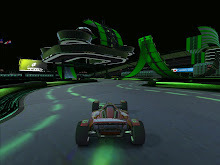 We played TrackMania United Forever on the "Let's Rock!!!" server (We being: That One Guy, Tsam, and Atholon [for a few minutes]). It was an interesting night. There were always 50+ racers on the server. I only played for 2 hours; Tsam joined me late and stayed after I left, so I'm not sure how long he was on. I placed in the top 10 twice and spent the rest of the time between 15th and 25th. Somehow, I still earned over 4,000 Ladder Points taking me to 19,000+ points; putting me 13th in the Utah Zone and in the high 60,000's in the World Zone. It was a good time and a lot of good competition, as it always is on that server. They have a great mix of old and new tracks... the old always classics from our intense TrackMania Nations days... "Let's Rock!!!" is definitely an FNG favorite to play on. Tsam, come tell us how you fared! I'm not sure how many points I ended up with after the few races I got to play, but I know it was fun! There were a lot of good racers on, and some fun tracks, too.